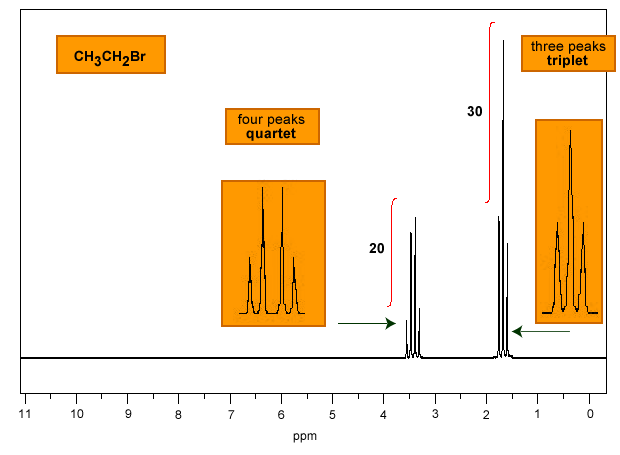 There are several important pieces of information that you can obtain from an 1H-NMR. The first is the chemical shift of the peak. This will aid in identifying the type of H atom that produced the signal. The second is the integration ratios of the peaks. 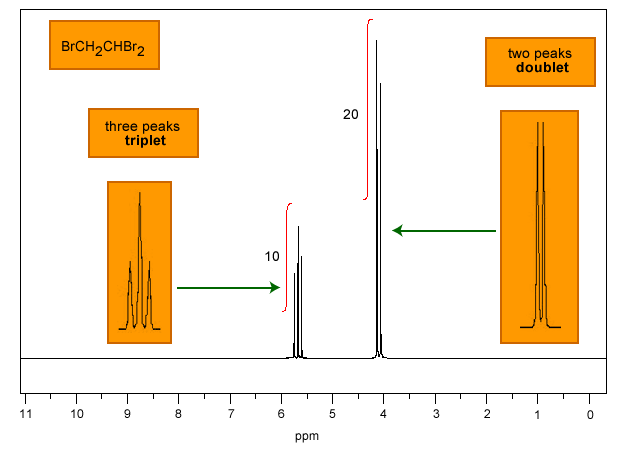 The area under a peak of a 1H-NMR is directly proportional to the number of H atoms that produced the peak. The area is calculated by integrating the area, done automatically for you by the software. On older spectra the integration curve was drawn on the spectra, modern software will produce this as a table attached to the spectra. The example below is for methyl t-butyl ether. The integrals (shown as the red curves) are in a ratio of 333:1000 or 1:3. This implies that the peak on the left corresponds to the methyl group attached to the oxygen (as expected since the O will deshield the H atoms). The peak on the right is the three methyl groups of the t-butyl group, less deshielded as it is further away from the O atom. Note that we get the simplest ratio of H atom types (1:3, methyl : t-butyl) not the true ratio of 3:9. 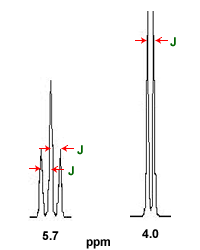 The NMR above has absorptions which are called singlets, a single sharp peak. However, in most cases, this is not the norm. Absorptions are split into groups of peaks due to coupling between adjacent protons in the molecule. 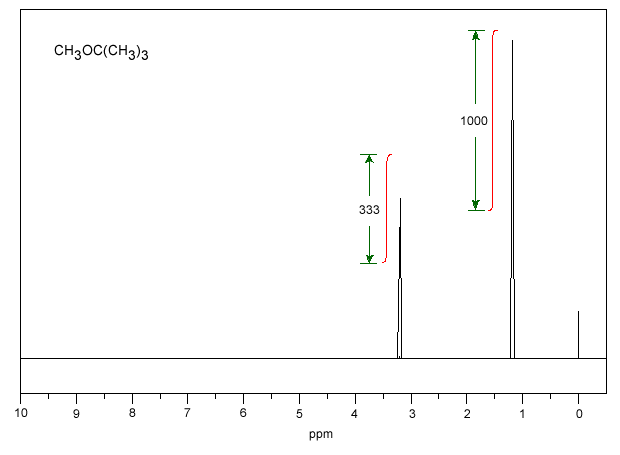 The 1H-NMR of 1,1,2-tribromoethane is shown above (integration ratios of 10:20 or 1:2). Note that the peaks are now split into a group of two peaks on the right, a doublet and into three peaks on the left, a triplet. The relative areas under the peaks are 1:1 for the doublet, and 1:2:1 for the triplet. The triplet corresponds to the -CHBr2 (most deshielded) proton and the doublet to the -CH2Br (most shielded) protons. This also agrees with the integration. 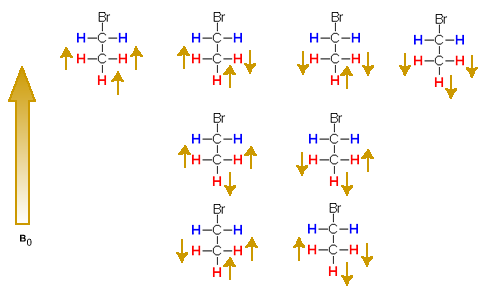 Spin-spin splitting occurs between unique types of H atoms on the same or adjacent (vicinal) carbon atoms. This occurs because the magnetic fields of each H atom can interact with the magnetic field of other H atoms. The interaction is only important (i.e. 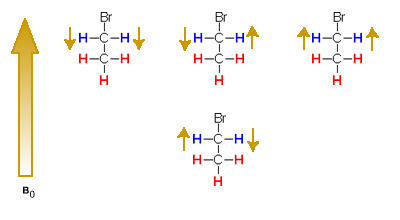 leading to spin-spin splitting) when the H atoms are "chemically different" from one another (see preceding page). The methine (-CH-) hydrogen can assume two magnetic spin orientations, with or against the external field. As a result the peak for the adjacent methylene group is split into two lines of equal intensity, a doublet. The methylene (-CH2-) hydrogen atoms can again assume one of two magnetic spin orientations, with or against the external field. 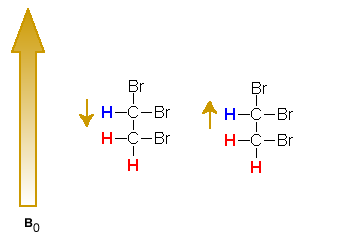 However, in this case these are two H atoms that are identical so there are three possible combinations of their two spins. The first (shown on the left) is both are spin down, the next is both spin up (shown on the right). 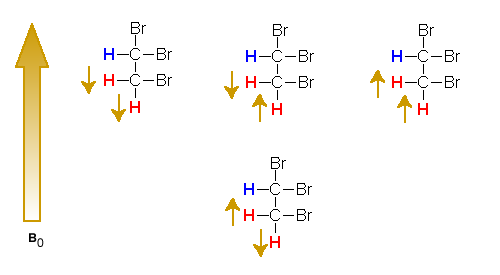 There are two possible ways for the 1 spin up and 1 spin down combination depending on which specific H atom is spin up or down (shown in the center). The combination produces a triplet with relative intensities of 1:2:1 for the adjacent methine group. The 1H-NMR for bromoethane is shown below (integration ratios of 20:30 or 2:3). Note the peaks are now split into a group of three peaks on the right, a triplet and into four peaks on the left, a quartet. The relative areas under the peaks are 1:2:1 for the triplet and 1:3:3:1 for the quartet. The quartet corresponds to the -CH2Br (most deshielded) protons and the triplet corresponds to the -CH3 most sheilded) protons. This also agrees with the integration. The methylene (-CH2-) hydrogen atoms can assume one of two magnetic spin orientations, with or against the external field. However, in this case these are two H atoms that are identical so there are three possible combinations of their two spins. The first (shown on the left) is both are spin down, the next is both spin up (shown on the right). There are two possible ways for the 1 spin up and 1 spin down combination depending on which specific H atom is spin up or down (shown in the center). The combination produces a triplet with relative intensities of 1:2:1 for the adjacent methyl group. The methyl (-CH3) hydrogen atoms can again assume one of two magnetic spin orientations, with or against the external field. However in this case there are three protons that are identical so there are four possible combinations of their spins. The most deshielded peak will occur when all three spins are aligned with the field (left most image). The most shielded peak occurs when all three spins are aligned against the field (the right most image). There are now two possibilities left, the case where two spins are with and one against field or two spins against and one with the field. The first case will be mose deshielded than the second case and so downfield form it. This combination will split the adjacent peak for the methylene protons into a quartet with relative intensities of 1:3:3:1. The coupling constant, (symbol J, units Hz) is a measure of the interaction between a pair of protons. In a vicinal type of system, Ha-C-C-Hb the coupling between protons Ha and Hb is Jab. The coupling of Hb and Ha must be equal to the coupling between Ha and Hb, of Jab = Jba. The implications of this is that the spacing betwen the lines for peaks that are coupled must be the same. Compare the peaks from 1,1,2-tribromoethane shown right. This means we can identify which peaks are coupled by the spacing between the lines. First, the chemical shift or location of the peak (in ppm) tells you how deshielded the protons are and hence their "local chemical environment", i.e. what possible deshielding groups maybe adjacent to the protons. Second, the integration ratios tell you the number of each type of proton in the simplest ratio. Third, the spin-spin splitting (coupling pattern or multiplicity) tells you the number of protons on the adjacent C atom. It will be one less than the number of peaks. This information combined gives us the basic skeletal structure of the molecule. For all spectra click on a peak to highlight the protons responsible for the peak. To see the integratals, right click on the spectra to open the menu, go to "view" and check the integrate" box.